Last Sunday I bravely stated that I might get to see three games this week. In the end I only went to one. I had a ticket for QPR's win over Wigan on Tuesday but after my four-year-old had a really bad night on Monday, I was too exhausted to go to the match (I'd been awake for 40 hours by the time of kick-off) so had to give it a miss. My next possible outing was Barkingside v Clapton on Friday night but the friend I would've gone with couldn't make it, after a late shift change at work, so I ended up on Saturday at Champion Hill. 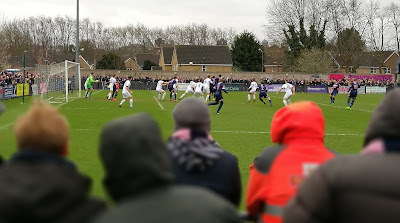 Despite not being a Dulwich Hamlet fan, I've got an incredibly soft spot for them and visit several times a season. After watching them defeat Braintree in the FA Trophy a couple of weeks ago, Saturday saw them welcome former Football League club Macclesfield Town for a quarter-final tie. Playing two divisions below the Silkmen, Dulwich came into the match as the lowest-ranked team left in the competition and as such started as underdogs. With over 2,800 packing out the small stadium in south-east London, the match got off to a very bad start for the hosts with two well taken goals, one a howitzer of a free-kick from close to 35 yards, by former Plymouth midfielder Luke Summerfield putting Macclesfield 2-0 up inside 20 minutes. Thankfully Gavin Rose's side rallied, pulled one back through Quade Taylor and went in at the interval just a goal behind. The second half was largely dominated by Dulwich but they couldn't find another breakthrough. It all looked over when the visitors had the ball in the net for a third time but it was ruled out for offside. With the game into its final few minutes and an equaliser proving elusive, the regulars around me all seemed resigned to a valiant defeat. Then with three minutes to go, a defender's high clearance got held by the wind and fell nicely for the Dulwich midfield who set up the on-rushing Ashley Carew to calmly bend a shot into the corner from 20 yards to earn an unexpected but thoroughly deserved replay. This will take place on Tuesday up in Cheshire so if you fancy being part of this huge night see the club's website for more details about coach travel or get yourself on a train from Euston station. With Lincoln City, Tranmere Rovers and York City winning the other quarter-finals, the victors will face an incredibly difficult opponent in the two-legged semi-finals which begin in two weeks time. 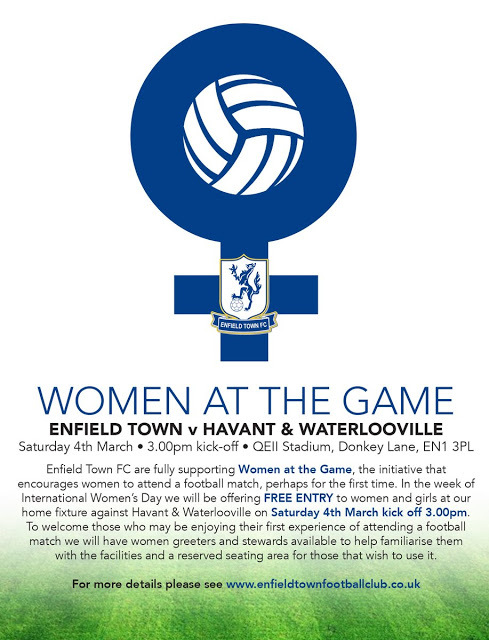 I'm heading on to late shifts this week so no games for me but before I sign off I'd like to give a special mention to Enfield Town who will be offering free entry to women and girls for their big Ryman League match against Havant & Waterlooville on Saturday to mark International Women's Day - a great gesture. There are over 80 matches in the London area over the next week with action in the Premier League, EFL, National League and several minor league and county cup competitions.